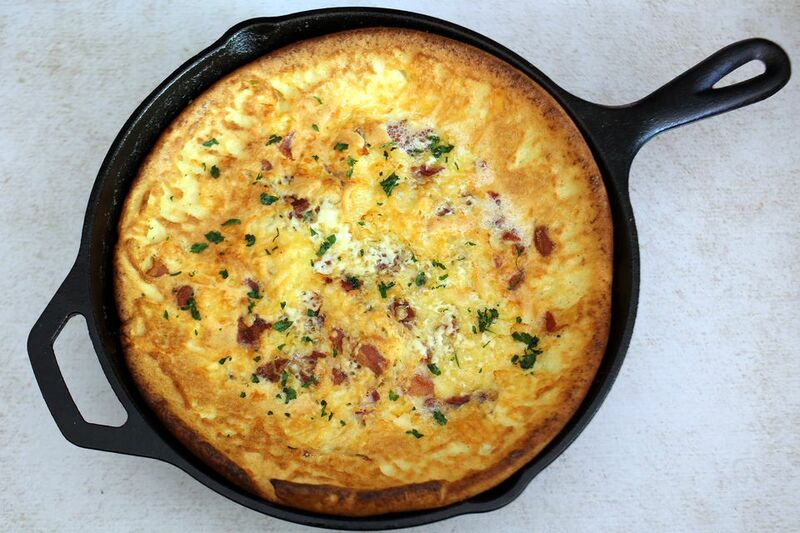 This savory pancake is an excellent breakfast or brunch dish, and it's very easy to prepare. The pancake is also quite versatile. Use bacon and cheese or use what you have on hand! Heat a heavy 10-inch skillet over medium heat. Dice the bacon, and add it to the hot skillet. Cook the bacon until it is crisp, turning to brown both sides. Remove the bacon to paper towels to drain. Set aside. Shred the cheese using a food processor with the shredding disk or use a box grater. Set aside. Position an oven rack in the lower third of the oven. In a large bowl or in an electric blender, combine the eggs, flour, milk, Dijon mustard, kosher salt, and pepper. Whisk or process until the batter is smooth. Wipe the heavy 10-inch skillet out, and add 3 tablespoons of butter. Place the skillet over medium heat, and swirl the butter so that it coats the bottom and sides. When the foaming subsides, pour the batter into the skillet. Combine the shredded cheese and cooked bacon, and sprinkle over the center of the egg batter, leaving an edge of about 1 inch to allow the batter to puff as it bakes. Bake for about 15 to 17 minutes, or until the pancake is browned and puffed around the edge. Turn the oven temperature down to 325 F, and let it cook for about 3 to 5 minutes longer, or until set. Remove the pancake from the oven, and garnish with chives or parsley. Slice into wedges, and serve hot. Make sure the skillet with melted butter is hot when you add the batter, and the oven should be completely preheated. Whisk the batter by hand or beat it with a blender or electric mixer for a smooth batter. Fontina cheese is a creamy melting cheese, but other cheeses may be used. This Dutch pancake would also be excellent with Gruyere, gouda, or a mild provolone. Mozzarella cheese is another good option. Instead of bacon, top the pancake with about 1/2 to 3/4 cup of crumbled cooked breakfast sausage or sliced cooked link sausage. Diced cooked ham may be used as well. For a vegetarian pancake, replace the bacon with vegetarian "bacon," meat replacement crumbles, or sliced mushrooms. Add 1 to 2 tablespoons of finely chopped sautéed onion. Add 1 to 2 tablespoons of finely chopped red or green bell pepper.